You've been drinking their blood for months, and now you can get to snack on them too. Zombie Jerky is the world's first artificial green colored beef jerky. While Zombie Blood runs freely with caffeine the Zombie Jerky does not contain the same energy enhancing capabilities. What's so great about Zombie Jerky? How about 13g of protein per serving, it's delicious, and it's green! i bought this for a friend for a present, she is obsessed with both zombies and beef jerky(go figure this exists and fit perfectly), and it was very well received. she loved it and actually put it on a shelve. 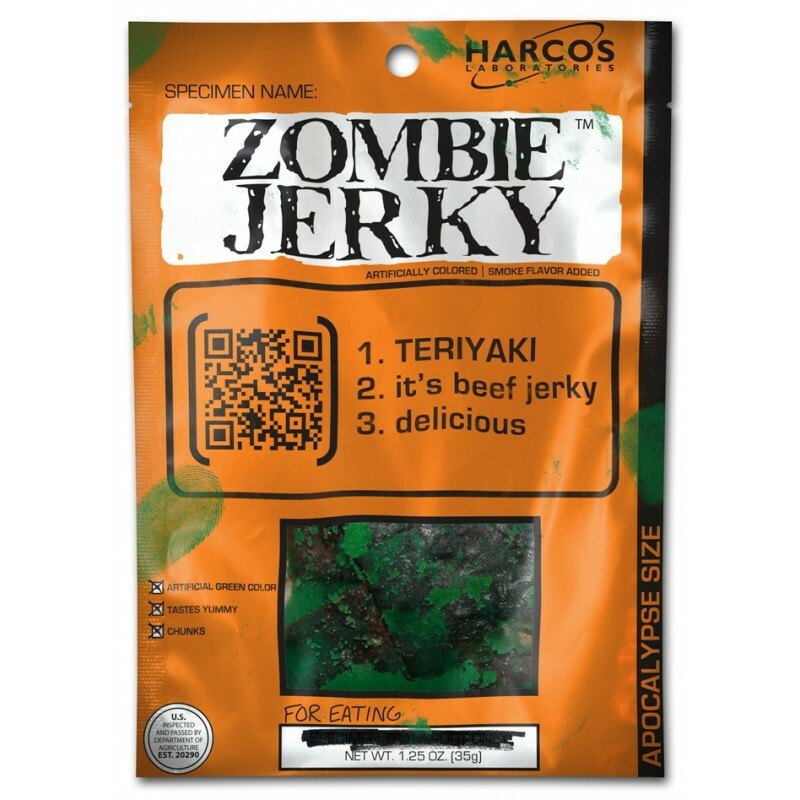 so if you have someone who loves zombies and beef jerky then get em this, if they don\'t eat it, the novelty of the product itself will still be well worth it. it was like $6.50 with shipping and all, so a little more expensive than normal jerky but you sure as hell wont get the awesome packaging of this (and after all, isn\'t that why you looked at anyway) with normal jerky. O and before i forget.......THESES DUDES CAN GET S#!T TO YOU IN A HEART BEAT!!!!!!!!! i seriously ordered this on Saturday morning... and it got here today(Monday) 2 days!!!! wow!!!....... SeRiOusLY, these dudes did a great job!!!!! (so much so that it possessed me to write a review mostly telling everyone[you] that these guys got their business together. i will DEFFINATELY(sp?) shop here again...........sooooooo BUY THEIR STUFF lol) Thanks Chemical Evolution team of dudes(and or chicks... don\'t want you to feel left out)!!!! your great! So I am a die hard jerky and nut fan. Anything that doesn't spoil and is simply to carry along and snack on is in my book. So for this stuff to be loaded with energy goodness I am on it. Your basic jerky injected with all sorts of stuff to give you that extra kick. Great flavor.